The function of your Family Room will likely evolve over time. It may transition from a playroom or game room into a room for entertaining or family gatherings. Bannochie Builders, Inc. can help you to create a Family Room Space that is right for your family now and into the future. The biggest factor for a successful family room renovation is Functionality. Do you want to create an Open Concept Living Space? Or would a cozy, quite room be best suited to your lifestyle? Bannochie Builders, Inc. can assist you in creating a Cohesive Layout and Design that flows with the rest of your Maple Grove, MN home. We can add in lots of Organized Storage, Lighting and a Focal Point for the room. How do you envision using your Family Room? One of Bannochie Builders, Inc.’s talented designers can assist you in determining how you want the room to function and design a layout that works flawlessly. Ask yourself the following questions to help you Identify the Function of Your Family Room. Do you like to entertain friends and family in your home? Do you like an open concept living space with access to the kitchen or dining room? Does your family enjoy watching movies or sports together? Are you into playing video games with several controllers or cartridges? Should your family room function as a yoga or workout room? Do family members enjoy a quiet reading room with bookshelves and plenty of task lighting? Does your property have a gorgeous view that you want to showcase with a large window? Perhaps a Fireplace or Large TV will be the focal point. Would you prefer a child friendly space or an adult entertaining area? Or, do you want a family room that functions as both a children’s play area and an adult space? After you have identified how you plan to use your Newly Renovated Family Room it is time to focus on a Cohesive Layout and Design. Your family room should connect and flow flawlessly with other rooms in your Maple Grove, MN home. An Open Concept Living Space can have elements that define the space without closing it off from the rest of the open area. Think of furniture layout, paint colors, pillars and area rugs. Bannochie Builders, Inc. is a Licensed Remodeling Contractor with many years of experience with helping family’s love their homes. We can assist you with creating a Functional Family Room that is perfect for your family now and into the future. Our skilled designers can help you with a Cohesive Layout and Design concept that works for you. We can knock down walls for an Open Concept Space or add in Organized Storage for a clutter-free room. Don’t overlook the importance of Task Lighting and a Defined Focal Point. 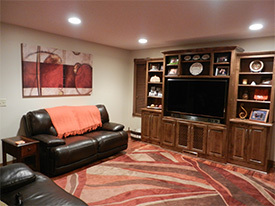 In Maple Grove, MN, call Bannochie Builders, Inc. for a Free Estimate on a Fantastic Family Room Renovation. This entry was posted	on Sunday, May 10th, 2015 at 2:41 pm	and is filed under Family Room Remodeling, Interior Home Remodeling. You can follow any responses to this entry through the RSS 2.0 feed. You can leave a response, or trackback from your own site.